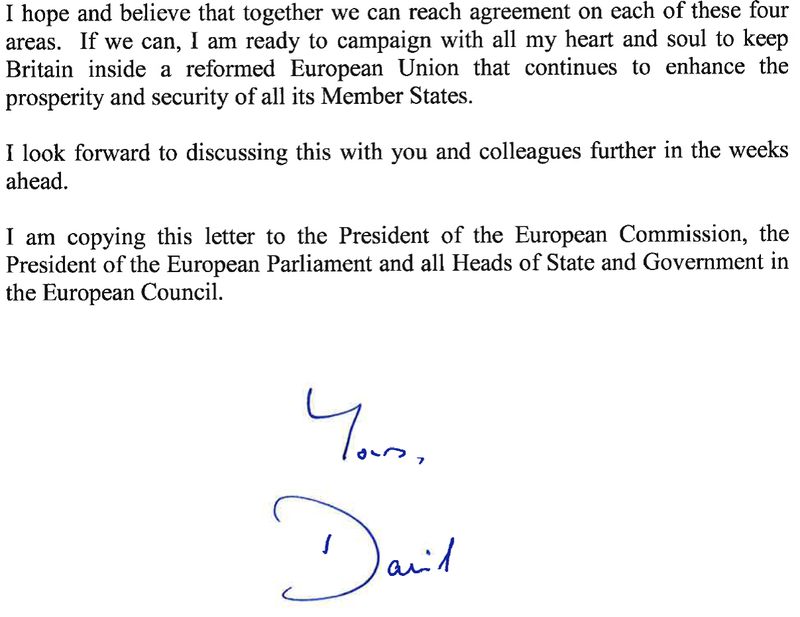 David Cameron’s letter to Donald Tusk may not have contained much that we didn’t already know, but the British press are not overly concerned by the continued vagueness. Cameron may have set out four broad demands to the EU, but it is the fourth, a ban on EU migrants claiming benefits in the UK for the first four years, has dominated discussion. The consensus in the British media is that Cameron’s fourth demand will prove hardest for him to secure. The BBC’s Katya Adler says that ‘the sticking point is undoubtedly in-work benefits’, a suggestion with which the Financial Times agrees. However most agree that Cameron has a tough task with his entire renegotiation. Chris Ship of broadcaster ITV says that the Prime Minister’s reform demands leave him facing ‘an uphill battle’. The conservative press has responded with a sense of pessimism and even futility at the prospect of striking a deal with the likes of Jean-Claude Juncker and Martin Schulz. The Daily Telegraph laments that ‘within minutes’ of setting out his demands, Cameron had been rebuffed by Juncker and Schulz, who is reported to have called the plan ‘illegal’. The Daily Mail, which takes a populist and even more strongly anti-EU line, was quick to point the finger at Brussels rather than Cameron, with the headline ‘Brussels tells Cameron his plan to ban migrants claiming benefits for four years is “highly problematic”’. Cameron is certainly not immune from criticism though, with the Daily Telegraph accusing him of ‘backtracking’ on the migrant-benefits issue, while the Daily Mail is desperate to see a ‘flash of steel’ from the Prime Minister. For Toby Young, writing in the Daily Telegraph, it is already too late. For him, the reform package is too feeble and he has made up his mind already. In Europe Cameron’s migrant-benefit demand may seem too much, but Young suggests that anything short of a British opt-out from free movement– a popular stance among British people – is worthless. The Daily Mail subsequently updated its story, quoting Conservative MP Jacob Rees-Mogg, saying that Cameron’s proposals were merely ‘thin gruel’. At the other end of the political spectrum, the Independent, Britain’s most Europhile daily newspaper, a strong advocate of free movement, claims that Cameron has been ‘reported to the statistics watchdog over questionable EU migrant benefit statistics’. In his speech on Tuesday, the Prime Minister had claimed that almost half of EU migrants to the UK are on benefits. The Independent is, however, keen to echo Cameron’s sentiment that there would be no going back from a Brexit vote. The Financial Times disagrees with this, suggesting that Brexit would not be the end of the matter, but would lead to further negotiations with Brussels. The Economist believes that EU membership is, on balance, better than Brexit even before a renegotiation. While it believes that the Brexit debate is a mess that Cameron has inflicted upon himself, it has some praise for his EU reform proposals, saying that they are pragmatic. It also says they would be ‘modestly good for Europe’, not just for Britain, a view Open Europe Berlin’s Michael Wohlgemuth echoes in his blog. Cameron is also praised for his political astuteness, as he has a chance of humouring ‘an electorate that knows and cares little about the EU’, who will most likely vote to remain in once he comes back from Brussels with a ‘deal’. However it is all too clear that Cameron will back the campaign to Remain, whatever the outcome of his renegotiation. The Financial Times agrees, making much of Cameron’s comments that EU membership contributes to the UK’s national security. 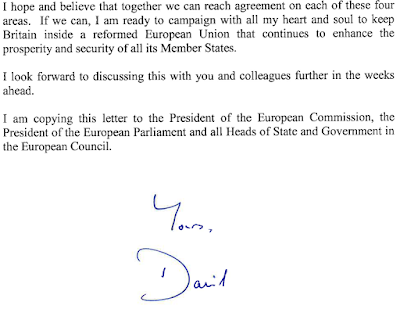 It is the first time the Prime Minister has linked EU membership to national security, leading the newspaper to conclude that he is already ‘rehearsing the arguments for the UK to remain in the bloc’. The FT thinks that Cameron’s aims are achievable, but that he must get to work making a pro-EU case to the British people. The left-leaning Guardian, not a natural supporter of a Conservative Prime Minister, is among the more optimistic voices in the British press. ‘David Cameron signals flexibility on migrant benefits in EU letter’, the newspaper reported, far from accusing him of backtracking. Cameron has hinted that he is willing to strike a deal on the migrant-benefits demand, and the Guardian sees this as a ‘softening’ of his stance and a ‘willingness to adapt’. Also in the Guardian, legal journalist Joshua Rozenberg is also optimistic, dismissing the notion that Cameron’s reforms will fall down due to legal issues. The obstacles, he writes, are political rather than legal, because it is perfectly possible for treaties to be amended if there is agreement among the states that signed them. ‘Where there is political will there’s a legal way.’ He also points to the precedent for the flexible union that Cameron wants: after all, Britain currently finds itself in the single market even though it retains its own currency. In another article however, the paper criticises the entire referendum process as a ‘phoney war’ and accuses Cameron of acting like a ‘gambler’ by putting the question of Brexit to the people. Though Cameron’s speech was and letter were ‘cautious’, he ‘should have made a more committed case for Britain in Europe’, the paper argues. Across the Irish Sea, the Irish Times reports, perhaps unsurprisingly, a positive Irish response to Cameron’s EU demands. The newspaper says that the Irish government thinks that the demands pose few problems, with the exception of the migrant-benefits demand, which could prove trickier. There is a frustration in the German press that Cameron’s letter to Tusk and his accompanying speech fail to set out his demands in any detail. Die Welt complains that not a single aspect of Cameron’s speech contained anything we did not already know. ‘Ganz neu ist das ja nicht’, writes Matthias Thibaut in Handelsblatt, while FAZ’s Jochen Buchsteiner says that once again the Prime Minister has kept things vague and chosen not to reveal what is really on his wishlist. Buchsteiner says that we know what Cameron’s ‘four baskets’ for reform are, but not what is in them. The entire referendum process is shrouded in vagueness too – the British people may know what they are voting for in five weeks’ time, or perhaps not until next year. However, both newspapers understand the difficult political balancing act that Cameron faces. While Handelsblatt talks of the farsighted politics of Cameron’s pragmatism, Süddeutsche Zeitung calls Cameron’s reform demands short-sighted. Stefan Kornelius argues that the UK’s referendum will be reduced to a referendum on the way the EU’s borders work. While Cameron’s reform demands may be broadly justified, he is going about it in too robust and insular a manner. While Süddeutsche Zeitung says that it will not be in the EU’s interests for it to let the reform negotiations get out of control, the FAS has more explicitly encouraging words for Cameron, saying that in Angela Merkel he has an ally in Europe. The Neue Zürcher Zeitung paints a similarly optimistic picture. Although the EU will not give Britain any special treatment or special status, Brussels knows full well, that a Brexit would be a terrible backwards step for the European movement. Nevertheless, the NZZ and Wiener Zeitung agree that Cameron faces a balancing act, with the migrant-benefits demand the obvious crunch point. For Die Welt, the migrant-benefits demand is the most substantial, but it regards the entire exercise as a bluff on Cameron’s part. The important question is not whether Cameron can get his reforms accepted, but whether he can persuade voters in the UK to vote to stay in the EU. Cameron’s reform package comes in for strong criticism, with the newspaper attacking Britain’s isolationist ‘Inselposition’. The German press are not falling for Cameron’s ‘bluff’. It is all too clear where he really stands on the EU. No one believes that he would really back a vote to leave the EU. Edward Aldred has recently graduated from the University of Oxford where he studied German. He is currently working as in intern with Open Europe Berlin.